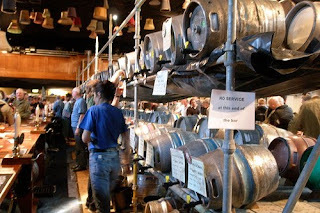 Something I didn't do enough of last year was attend beer festivals. Great British Beer Festival and Thanet Easter Beer Festival were pretty much it. I made a resolution at the beginning of the year to make more of an effort on the festival front, so persuaded the other half to take a trip down to Battersea on a wet Wednesday evening with me. The festival is quite modest in size with about 150 beers on a combination of gravity and hand pull, and about 20 Ciders and Perry's. 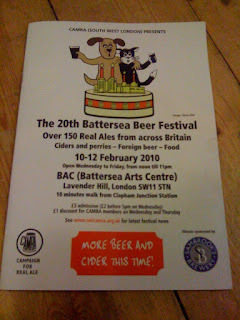 It ran for three days from Wednesday through to Friday and offers the usual discounts for CAMRA members. A big plus was that you could buy full, half and third pint measures, something that you don't see at every festival you go to. The venue was full but not so busy that you couldn't find a seat. All of the beer I tried was in great nick and there was hot food available at reasonable prices. The beer list didn't blow me away but there was more than enough to interest most people, with a specific focus on some smaller local breweries. A small selection was also dedicated to foreign beer, the majority of this being made up of bottled Belgian and Germany beers. I've heard a lot about Moor beer, but I'd never tried anything they produce. First drink of the night was Moor Peat Porter, a deep rich porter at 4.5 per cent. A big, full, creamy mouthful of roasty malt and dark fleshy fruits. I don't fully understand this beer though, there's no real peaty note to the taste and (upon checking the Moor website) there's no reference to peat anywhere in the grist or tasting notes. It was a good porter don't get me wrong, I just don't know where they're going with the name. Fancying something a bit lighter and easy going, I moved on to Dark Star Hophead. I've expressed my love for all things Dark Star (to some extent) here. They can't put a foot wrong if you ask me, everything I've tried by them has been exceptional. Hophead is a 3.8 per cent pale ale that just screams floral and citrus. For a low ABV beer, the mouthfeel is exceptionally full and smooth. On the palate you get a real lemon sherbet hard boiled sweet flavour and then subtle bitter finish that's slightly drying. Apparently there's an Amarillo version of this, which I'd love to try. I missed out on Rudgate Ruby Mild at the Great British Beer Festival. It was awarded Championship Beer of Britain 2010, so naturally it sold like hot cakes. I took the chance to try it at Battersea and was impressed. Not blown away, but quite impressed. Very fruity, caramelly and some subtle roastiness. The third I had felt a little too carbonated though, something you just don't expect, and something that doesn't really work in a mild. Otley 01 was beer of the evening by a distance. I like the flavour of hops and I enjoy DIPA's and IPA's, but I have to admit that I sometimes find them too much. I had Stone Ruination a while ago (see here) and I was very disappointed. I'd been looking forward to it for quite a while, but I just found it far too unbalanced. The nose was just over the top hop and the taste was just far, far too sweet. It's easy to put loads of hops in a beer, but it's not easy to balance that against sweetness. I sometimes find huge IPAs just too bitter and, consequently, quite difficult to get through. Now, I'm not suggesting for one minute that Otley 01 is in that style, but it does have bags and bags of the freshest hop flavour. The beauty being that this hop flavour is balanced delicately against some sweetness and some subtle bitterness. This beer showcases hops at their best, without the arse-clenchingly bitter footnote. To finish things off, I planned on a Thornbridge St Petersburg, only to be denied by a cask that hadn't settled in time. Still grinning from the Otley 01, I thought I'd give their 02 a try. It was OK, a bit oily in texture, some malt, some hop, not great. I'd give it another try with my palate a bit less fatigued, it was always up against it after the 01. All in all, a good night and a good festival. Efficiently run, good beer and well worth the trip out on a Wednesday evening. Well worth checking it out in 2011. On the subject of mild, I've got a whole post planned where I express my love for the style. I haven't really touched on it here, but it's something I plan to do in the near future. On the Otely 01 front, I really hope it's as good out of the bottle as it was from the cask. I love this beer festival. I went every year for the last 4 (starting when I was in Uni) but was away this year. Last year was crazy-busy. I think the Otley 01 is a great beer - I had it in the rake ages ago and loved it. Shame you missed St Petes, that's a rocking stout. There's a few good fests coming up: London Drinker and then the big one... Planet Thanet (love PT fest)!! I heard that last year the basically ran out of beer by the Friday. People were showing up and there was nothing to drink! Not sure if I'll make London Drinker but I definetly will be at Planet Thanet. That festival is so disproportionately good ... nothing ever happens in Thanet! How do you tell if an imperial stout hasn't settled? - you'd have to shine a hunting torch through the bugger! Haha. Perhaps they did! The bloke behind me at the bar wanted some as well, so maybe it looks like it was a popular choice. Maybe it arrived late or something and they knew it hadn't been standing still for long? Got to try it somewhere else and really enjoyed it. Worth keeping an eye out for, if you haven't had it before.